With the holiday season in full swing, you’re likely seeing lots of decadent sweets and fancy holiday meals on your favorite food blogs. Since other blogs have those things covered, I’m bringing you something totally different: a healthy, hearty, scrumptious one-skillet meal, that takes less than 30 minutes to make. It’s packed with some of my favorite fall/winter produce — sweet potatoes, brussels sprouts, and apples — along with a generous helping of chicken sausage, aromatics, herbs, and some tasty bacon to kick things up a notch. Why I am I sharing this recipe now? First, many holiday tables feature sweet potatoes, apples, and/or brussels sprouts, and this is a great way to use up any of those that you have leftover after the holiday festivities. And second, after eating and making lots of rich, indulgent, special occasion-food, I crave foods that are lighter, cleaner, and quick-to-make. This one-skillet meal is all of those things, plus it is absolutely delicious. The combination of flavors and textures is perfect. 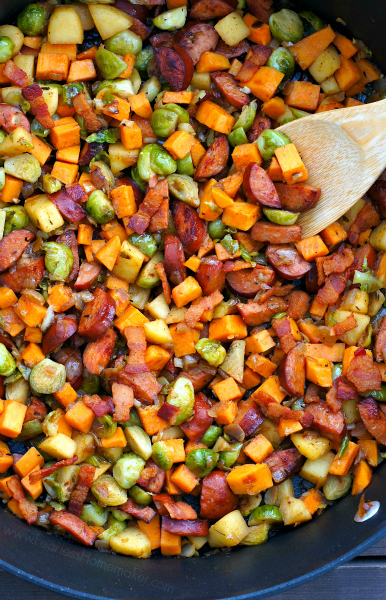 Tender sweet potatoes, earthy brussels sprouts, caramelized sausage, crisp bacon, and sweet apples marry beautifully, with the help of savory aromatics, herbs, and a dash of balsamic vinegar. I found this meal to be wonderfully complete on its own, but if you want to round it out even more, try serving with farro, quinoa, or wild rice — all of those would complement this fantastically. If you’ve followed my blog (or Instagram account or Facebook page) for any period of time, you know that homemade pizza is one of my favorite things to make. Just look at this and this and this and this and this. 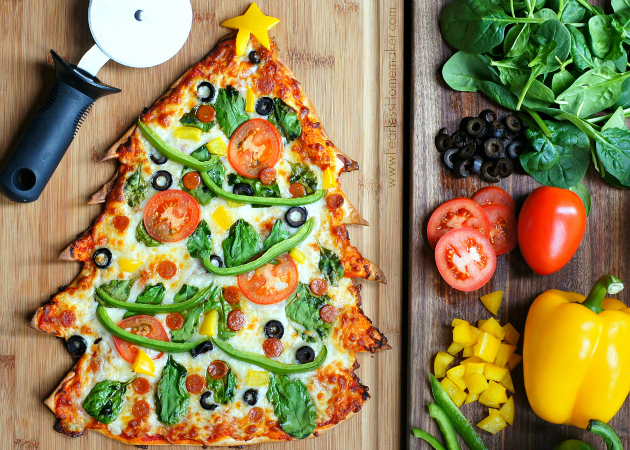 I love homemade pizza because it’s easily customized so everyone has toppings they love, AND it’s a ton of fun for everyone to help with the designing / topping of the pizza. This Thin Crust Pizza recipe (which I used here and in all the pictures linked above) is, hands-down, the BEST thin crust pizza recipe. It is deliciously thin + crackery, so easy to prepare, requires zero rising time, + takes less than 10 minutes to bake from start to finish. 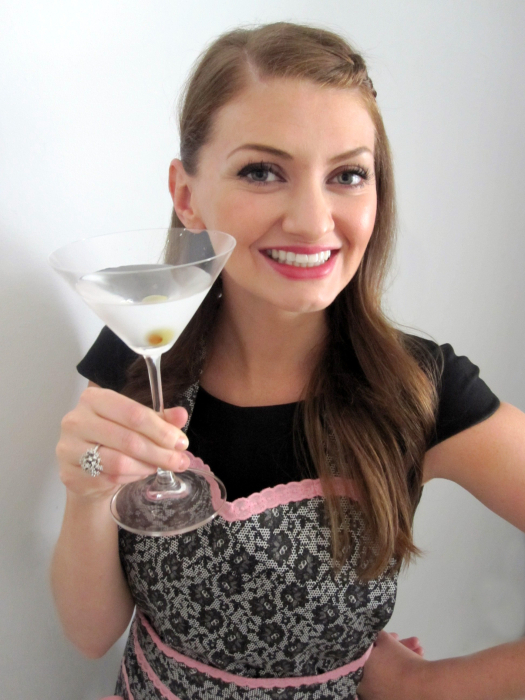 It’s not surprising that it’s the most popular recipe on this blog! Many people who celebrate Thanksgiving have one Thanksgiving flavor that they look forward to the most. For many, it’s the turkey. For others, it’s the pumpkin pie. But for me, it’s fresh cranberries. I adore cranberries in jams, chutneys, and relishes, and love them even more so in baked goods + sweets. And now, let me introduce what is quite possibly my favorite dessert I’ve ever made — Cranberry Shortbread Cake. While I love a chocolaty dessert as much as anyone else, this is the type of dessert that really appeals to me — it’s a bit unexpected (who would’ve thought to pair shortbread with cranberry!? ), and exquisitely, creatively showcases a fresh, seasonal fruit. 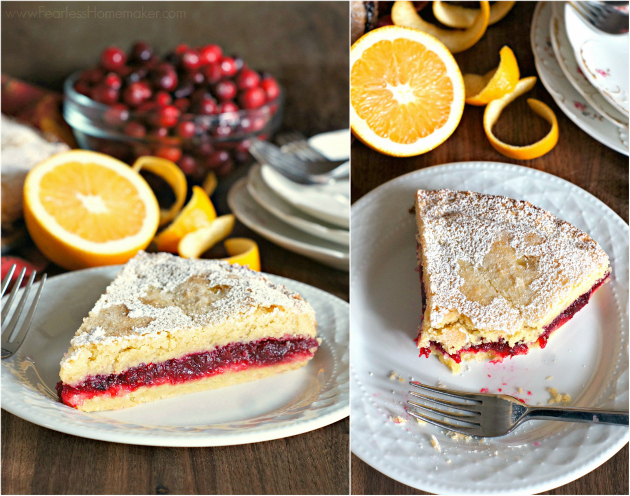 Buttery, luscious, beautifully-textured shortbread cake, is paired with a perfectly sweet-and-tart freshly-made cranberry/orange jam. 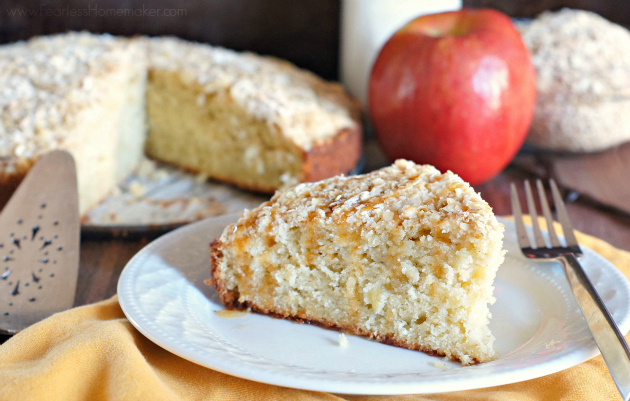 The combination of flavors and textures in this cake is out-of-this-world amazing. Presentation-wise, I initially planned to serve this cake with no garnish or decoration. However, while I was smelling it baking, I sensed it was going to be an exquisite dessert, and I wanted its presentation to wow as much as its flavors. So, I took some small paper leaves, laid them decoratively on top of the cake, and sifted a fine layer of powdered sugar over the cake. I then removed the paper leaf “stencils” and voilà! A cake as beautiful as it is scrumptious. 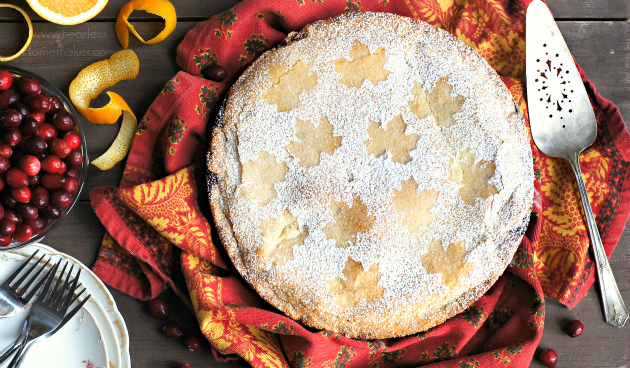 If you are looking for a head-turning, palate-pleasing dessert to add to your Thanksgiving menu (or any meal this fall), look no further. This cake is all sorts of deliciously spectacular! My toddler daughter is not a huge fan of breakfast foods, and she definitely inherited that trait from me. She (like me) would rather have leftover rice + beans, soup, or pasta for breakfast, instead of eggs, pancakes, waffles, or cereal. I am *exactly* the same way, so I get it! There is one breakfast food that she consistently loves, though — muffins! So I’m always experimenting with different muffin flavors, particularly ones that highlight the fresh flavors/produce of the season. And the most popular muffins in our house these days? 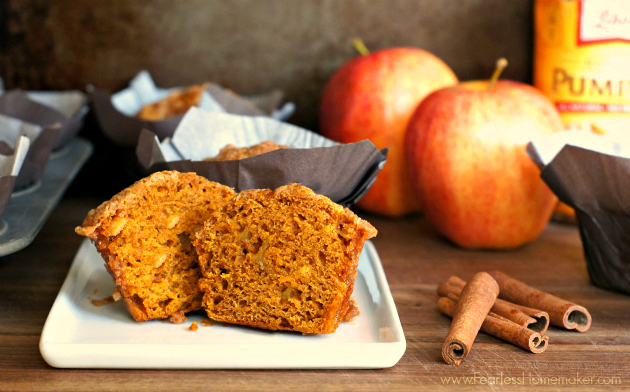 These Pumpkin-Apple Streusel Muffins. Do y’all freeze muffins? For those who don’t know, most muffins freeze (and thaw) beautifully. What I do is bake a big batch of muffins, let them cool completely, then store them in a ziplock bag in the freezer. When I’m ready for one, I pull it out of the freezer, microwave it for 20-30 seconds until warmed, and enjoy. You can’t beat a quick, delicious, ready-in-seconds homemade breakfast!